Taken At Midnight is a carefully researched commentary on Germany during the early years of Hitler’s Chancellorship. The story based on true events, plays out through the eyes of Irmgard Litten whose lawyer son Hans, in 1931, successfully prosecuted Hitler for the thuggish pre-election behaviour of his Nazi Brownshirts. The play opens with Hans’ arrest two years later, on the night that the Reichstag was burned. Hitler is now in power and the arrest is revenge. 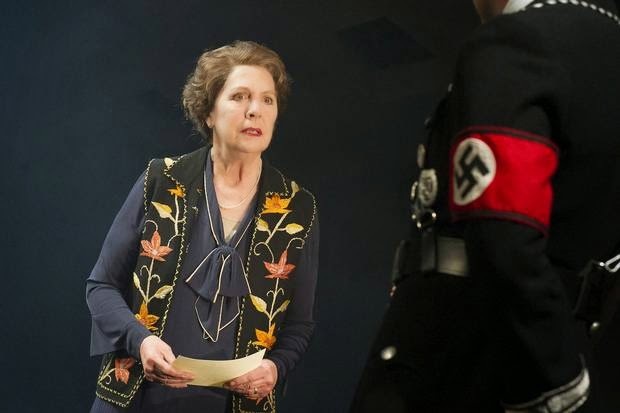 Penelope Wilton is Irmgard Litten in a performance that defines her as one of the greats. Committed to liberating her son from being drawn ever deeper into the belly of the Nazi beast, her journey is one of remarkable devotion. She plays the most lovingly committed of mothers, a woman who is simultaneously proud of her son’ principled resistance to the Nazis and at the same time desperate for him to betray his beliefs and lie to the regime, to save his skin. 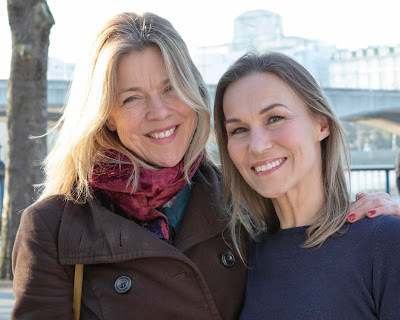 The paradox of her drama could not be more stark nor brutal and Hayhurst gives one of our finest actresses some of the most richly structured dialog of recent modern plays. Wilton’s performance alone demands that the play be seen. As Hans, Martin Hutson is heartbreaking in his defiance. His performance sees his character be degraded from a presentable professional man to a concentration camp inmate wearing both the yellow star of the Jews, (his father was Jewish) and the red triangle of the political prisoners on that terrible striped camp uniform. From an able bodied man sustaining his beatings, through to a cripple, body broken yet mind intact, Hutson movingly plays out Litten’s destiny. Hayhurst tells us about much of the everyday detail of the Nazi regime. John Light is Dr Conrad, the Gestapo captain responsible for Litten’s arrest and subsequent incarceration. His clinical detachment in executing his orders is as chilling as would be expected, but what disturbs even more is the chance meeting between him and Irmgard one sunny afternoon in a local park. Out of uniform the charming, chivalrous and refined Conrad offers Irmgard an ice cream, making for a powerful exposition of how the Nazi regime had become so woven into much of German society. Away from the park-bench though, Conrad's teeth are bared when later in the play he venomously expresses his hatred of the half-Jewish Hans. In another gem of a performance, David Yelland's Lord Clifford Allen economically represents Britain’s moral vacuity during its pre-war period of German appeasement. There is no happy ending to Taken At Midnight, with Hayhurst’s work being historically brilliant even if a little pruriently melodramatic in some of the early torture scenes. The acting is riveting and Church's direction of this Chichester Festival Theatre production is on point throughout. Top notch theatre.